Portadown took a crucial first step towards cutting out a 12-point deduction with a vital 2-1 victory over Ballinamallard United. The Ports fans had to wait four extra days before watching the team kick off the season - but Pat McGibbon’s players made it worth the wait with a sparkling Shamrock Park display. McGibbon spent his summer juggling off-the-field issues with a squad rebuilding job that led to a revamped roster for the opening game. The Ports players embraced the chance to finally focus on a game by attacking Ballinamallard from the first whistle. Mark McAllister operated as a lone striker but received regular support from deep thanks to the hard work of Sean Mackle, Stephen Hughes and Eoin Kirwan. Despite this home pressure, the first save of the night was made by David Miskelly as the goalkeeper dropped low to palm out Johnny Lafferty’s drive. Portadown grabbed the first goal of the season on 26 minutes as Garry Breen - one of the main positives since McGibbon’s appointment as Ports boss - headed home Henderson’s corner-kick delivery. Henderson posed a set-piece threat soon after by slipping a free-kick into Kirwan’s path but his shot lacked power. Kirwan then picked out Mackle in the penalty area but the header failed to test James McGrath. 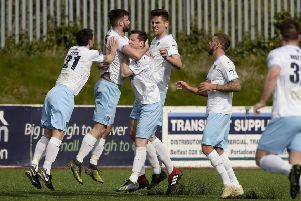 If the first half provided evidence of the Ports’ high-tempo football, the early stages of the second tested the resolve after Ballinamallard equalised on 51 minutes thanks to Shane McGinty’s header off a Jason McCartney cross. The Ports’ response featured two openings within a minute - but Mackle’s shot was saved and Kirwan’s effort blocked. McAllister’s attempt to curl the ball beyond McGrath ended in frustration after a Mackle cross and clever touch by Hughes. Tim Mouncey was drafted in as an emergency centre-back due to the late drama over Keith O’Hara’s withdrawal from the squad. Mouncey produced a superb pass from deep on 68 minutes that perfectly matched the run of McAllister - with the Ports striker slotting home under pressure to reward the hosts for such a positive response. Miskelly was called on to protect the lead with a smart stop off Lafferty. PORTADOWN: David Miskelly, Brendan Shannon, Matthew Parker, Garry Breen, Tim Mouncey, Robert Garrett, Niall Henderson, Stephen Hughes, Mark McAllister, Eoin Kirwan, Sean Mackle. Subs: Chris McGaughey, Mark Carson (Hughes, 85), Aaron Haire, Sam Simpson (Kirwan, 64), Mikey Withers. BALLINAMALLARD UNITED: James McGrath, David Elliott, Ryan Morris, Ross Taheny, Ryan McConnell, Johnny Lafferty, Shane McGinty, Adam Lecky, Shane McCabe, James McKenna, Jason McCartney. Subs: Stefan McCusker, Steve Feeney (McKenna, 77), Ryan Mayse, John Currie, Joshua McElwaine (Lafferty, 84).